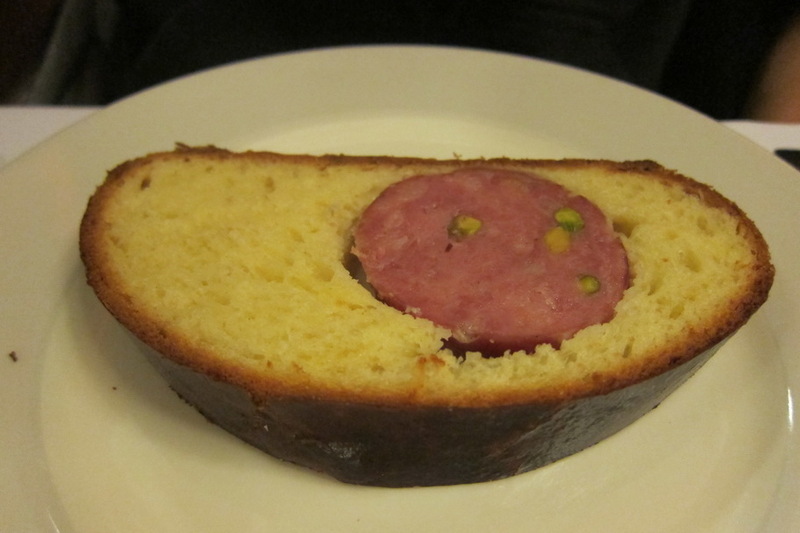 I had read that Lyon was the gastronomic capital of France (and possibly the world). 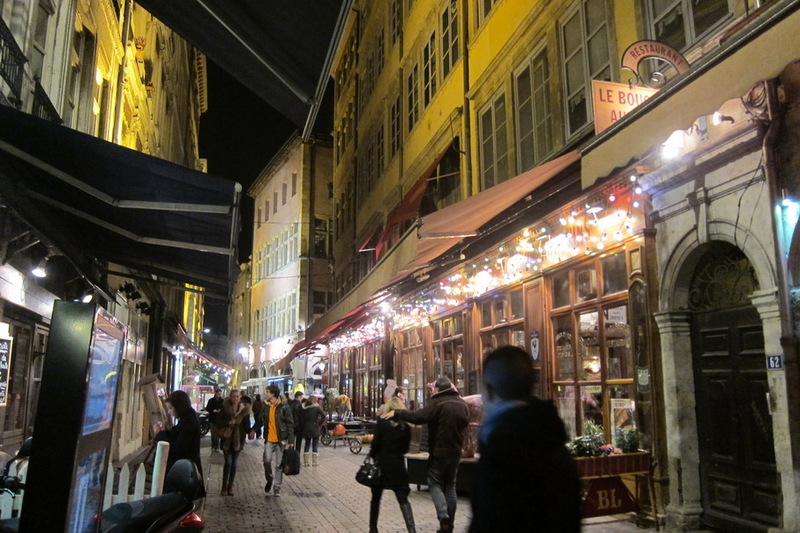 After spending six weeks in Paris and very much enjoying the food there, I had high hopes for Lyon, and I wasn’t disappointed. 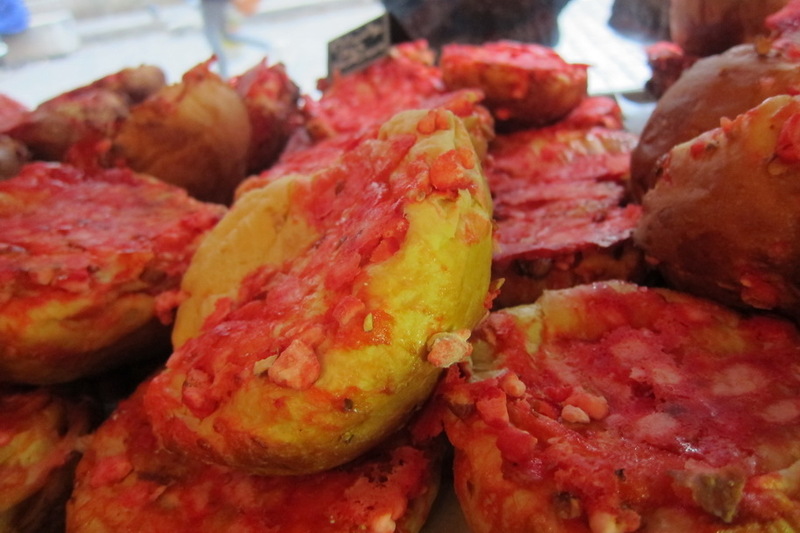 The most memorable food that I ate in Lyon was the pink pralines. Mr. Selfish and I were wandering the old town of Lyon and came upon a long line. We have taken to joining these long lines because there is usually a reason for the line. 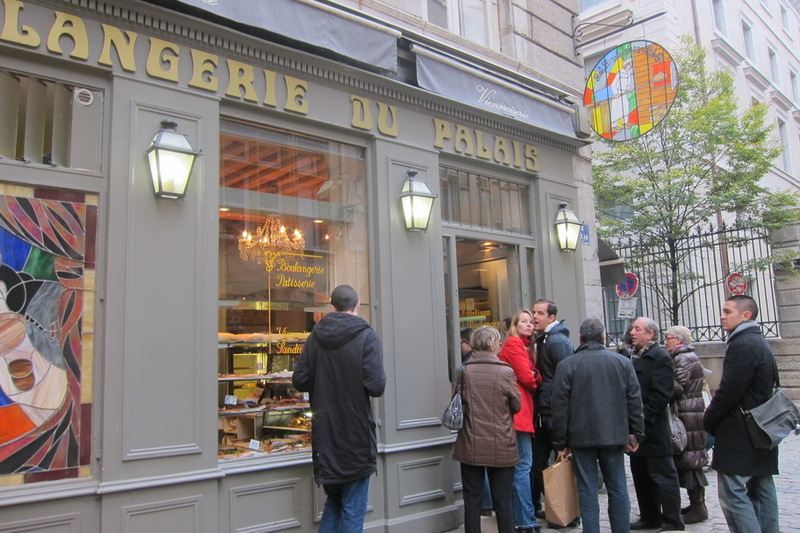 This time, the line was for a bakery, which specialized in Lyonnaise pralines. 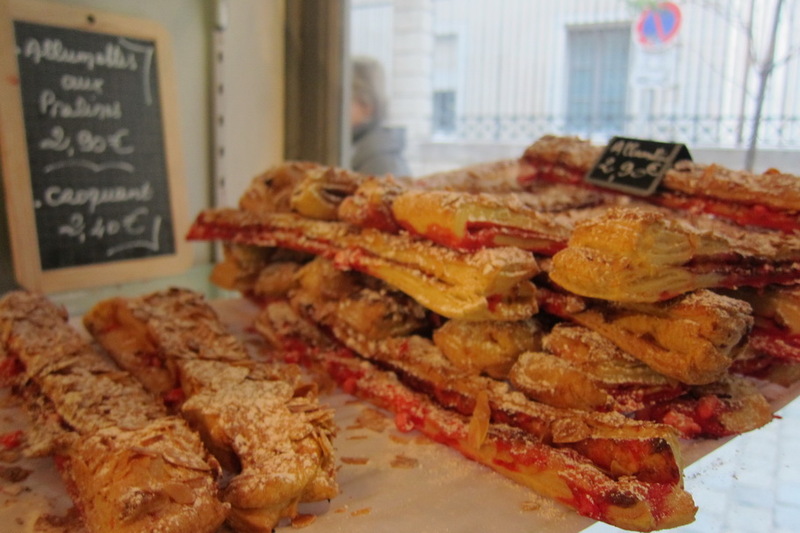 These Lyonnaise pralines are different from the pralines that we are used to in the States. 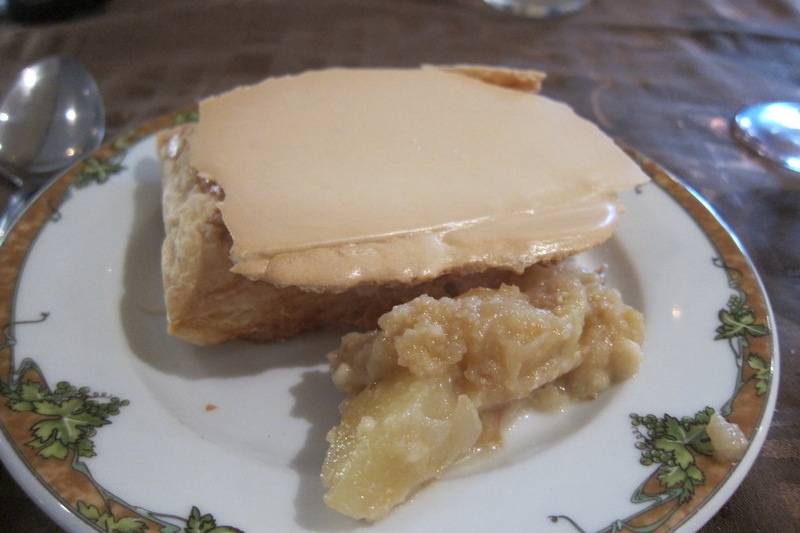 Although they are still almonds in sugar, they are not caramelized (unlike the American counterparts), which makes the texture nice and crumbly. 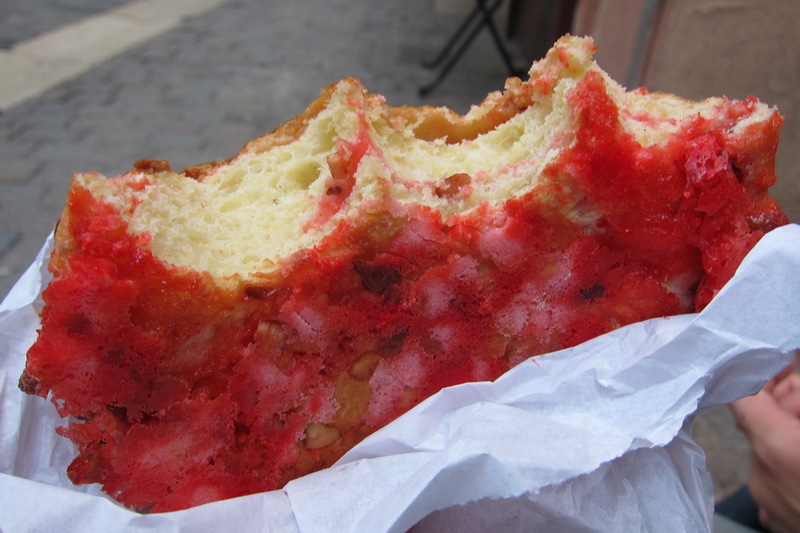 We had some bread with pralines and it was divine. 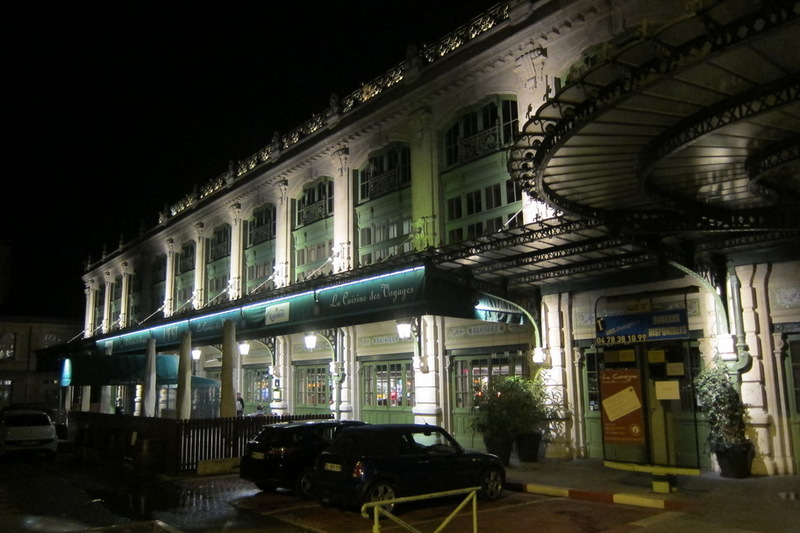 Mr. Selfish and I also ate at two brasseries by Paul Bocuse, who is a renowned French chef specializing in nouvelle cuisine. 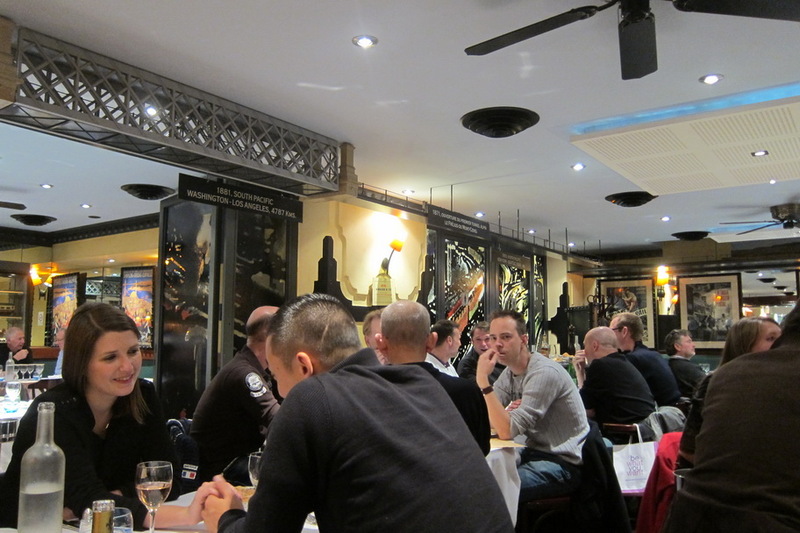 Other than his three Michelin starred restaurant, Bocuse runs four brasseries – each one named for a direction (north, east, west, and south) and each specializing in a certain type of cuisine. 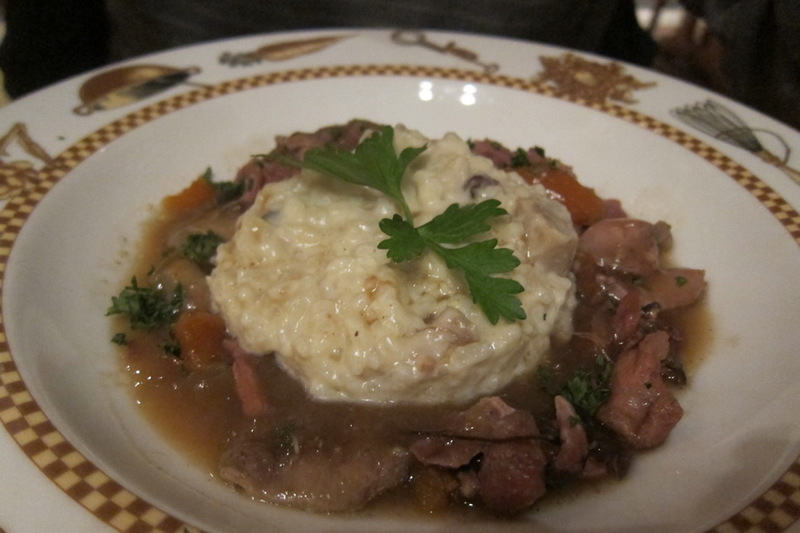 We ate at Le Nord and L’Est. 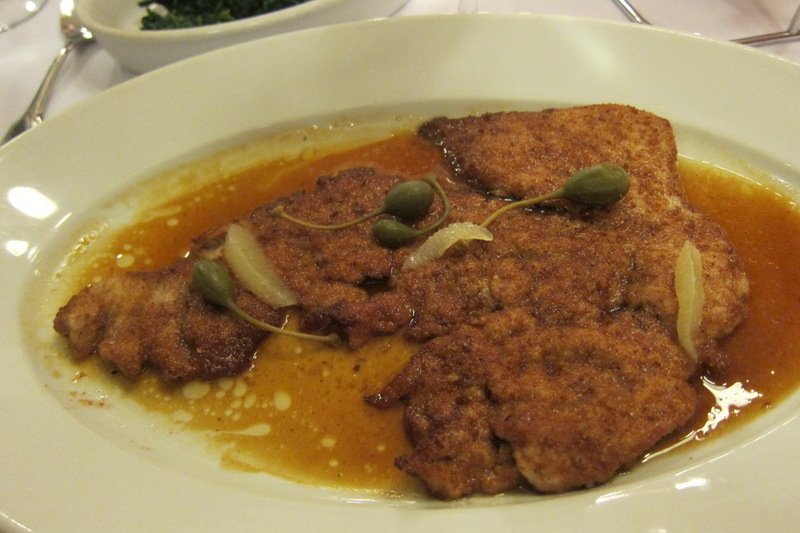 Le Nord is known for its traditional Lyonnaise food. 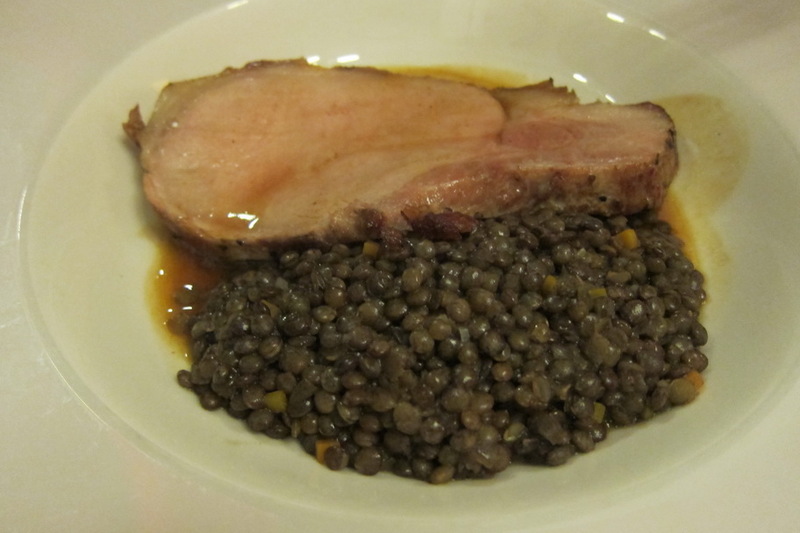 Mr. Selfish and I enjoyed the famous saucisson in a brioche, veal with mac and cheese, and a traditional pork dish with lentils. It was all very delicious. 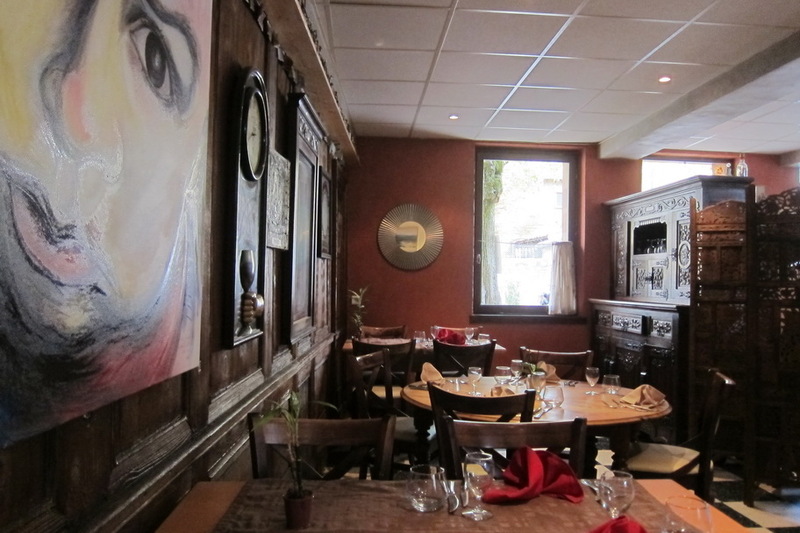 Because we enjoyed Le Nord so much, we decided to go to L’Est as well. 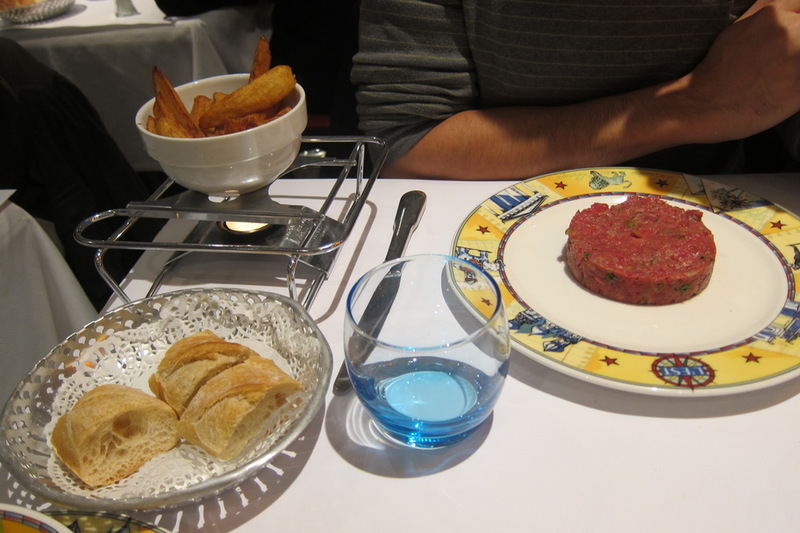 L’Est is located in the former Brotteaux railroad station, and its theme is “a journey in cuisine.” Mr. Selfish had the steak tartar and I had the seafood melody. 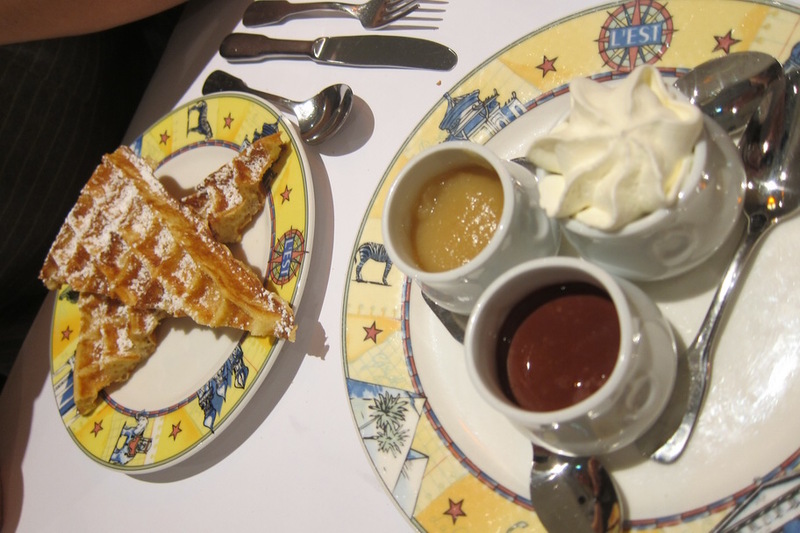 We also enjoyed a waffle for dessert. 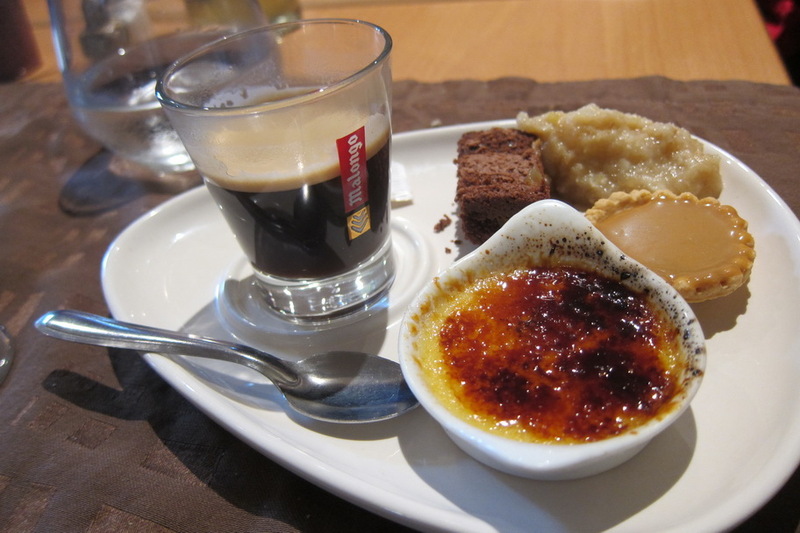 L’Est wasn’t as good as Le Nord but we tend to enjoy traditional food more. 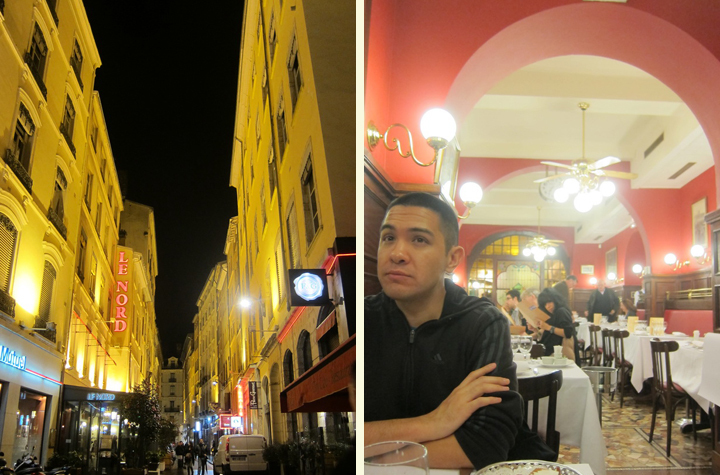 For our last meal in Lyon, we ate at Le Bouchon Aux Vins, which was average. 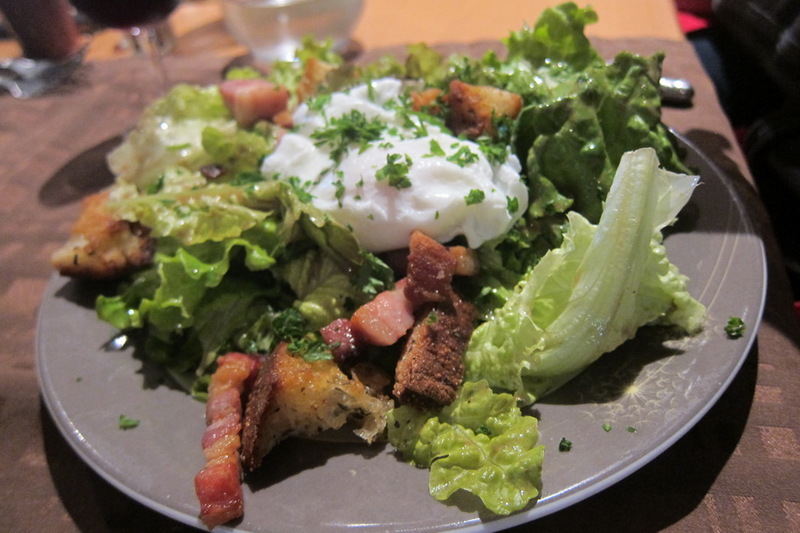 The Lyonnaise salad was the highlight but who can resist a salad with bacon and a poached egg? 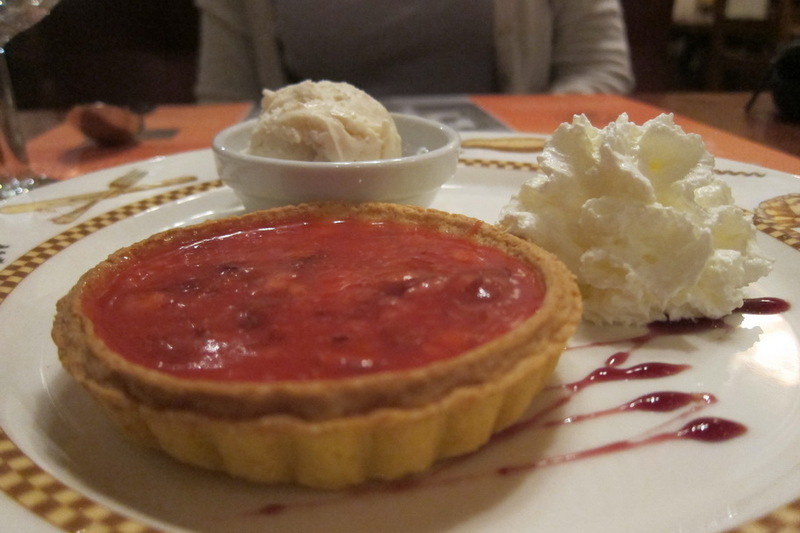 Also, we had a pink praline tart for dessert, which was pretty good. 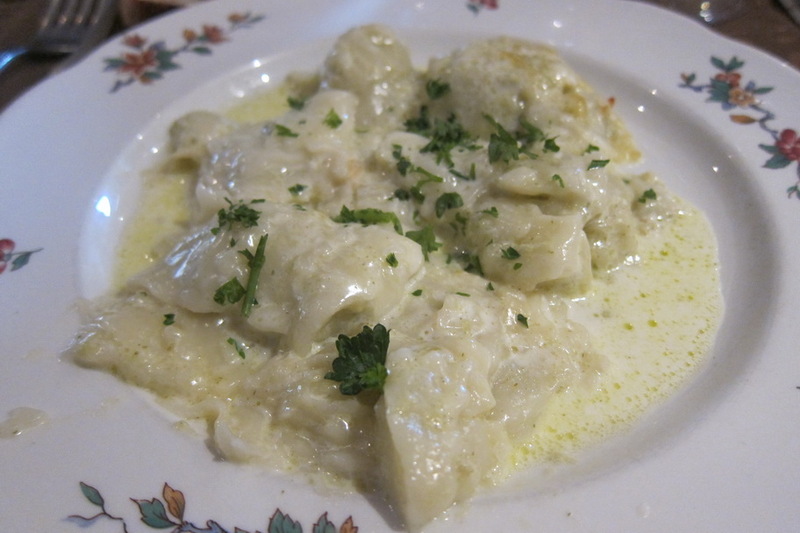 For some odd reason, Mr. Selfish ordered goulash, which does not originate from France. 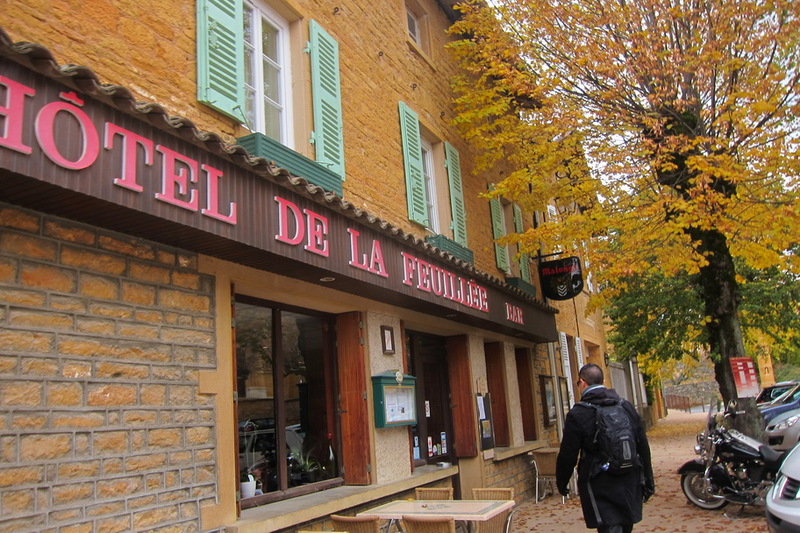 Finally, we took a day trip into the Beaujolais area, which we’ll discuss in more detail tomorrow. 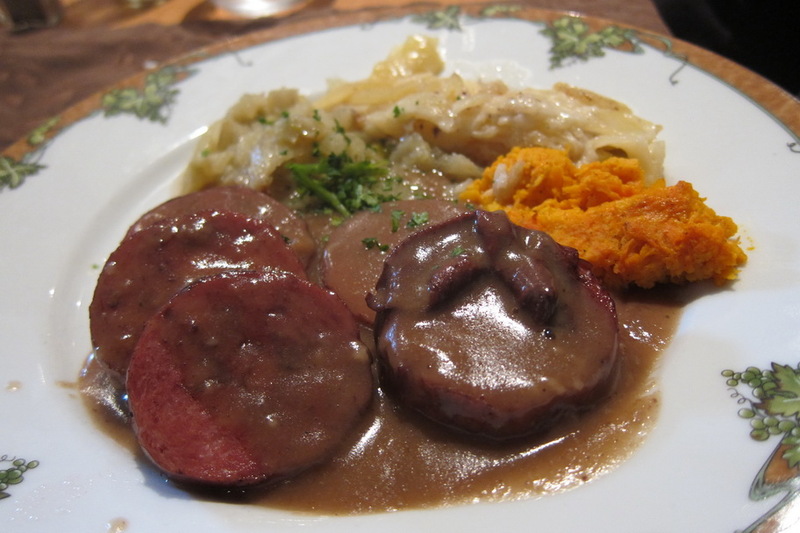 On that day, we had a delicious lunch in the town of Oingt. Mr. Selfish and I both had a three course meal. 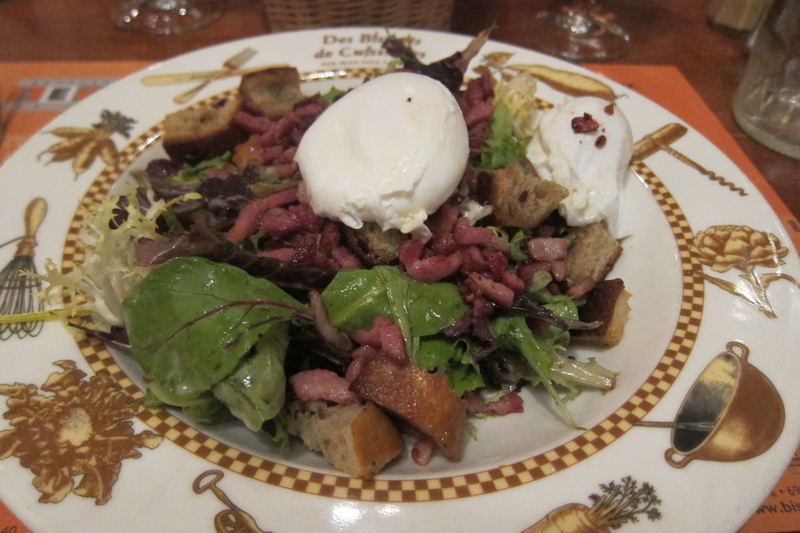 He had a Lyonnaise salad, traditional sausages, and a cafe gourmand. 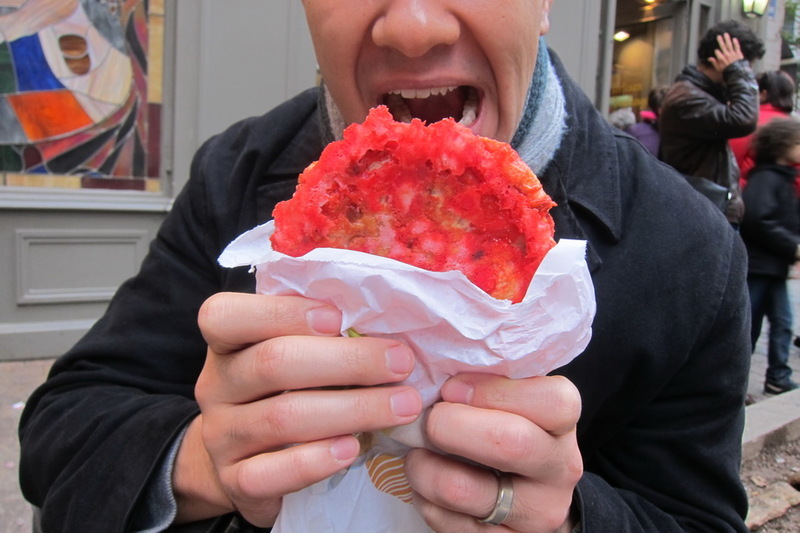 I had ravioli, duck, and some sort of sweet crumbly dessert. 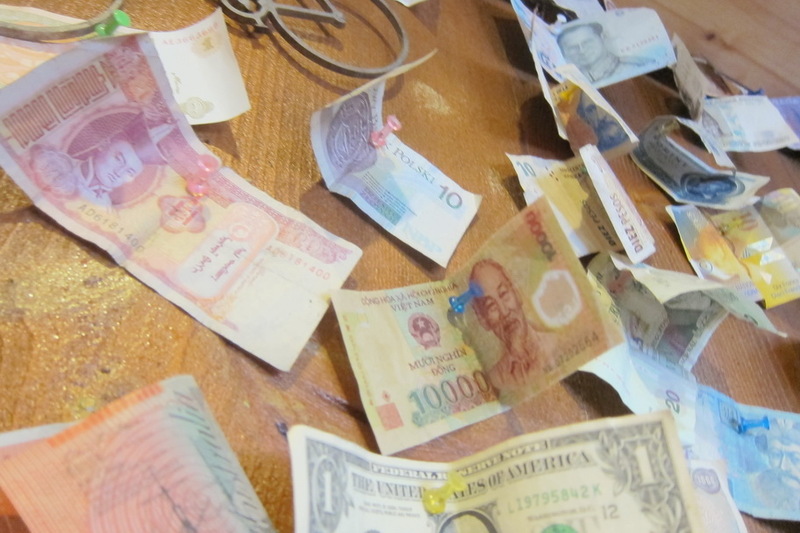 The restaurant had currency from all over the world tacked to its wall. I even found some Vietnamese dong! 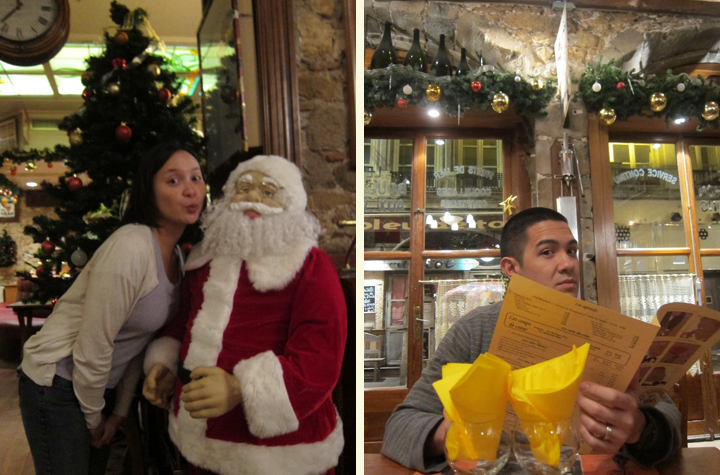 And, those were our culinary adventures in Lyon. 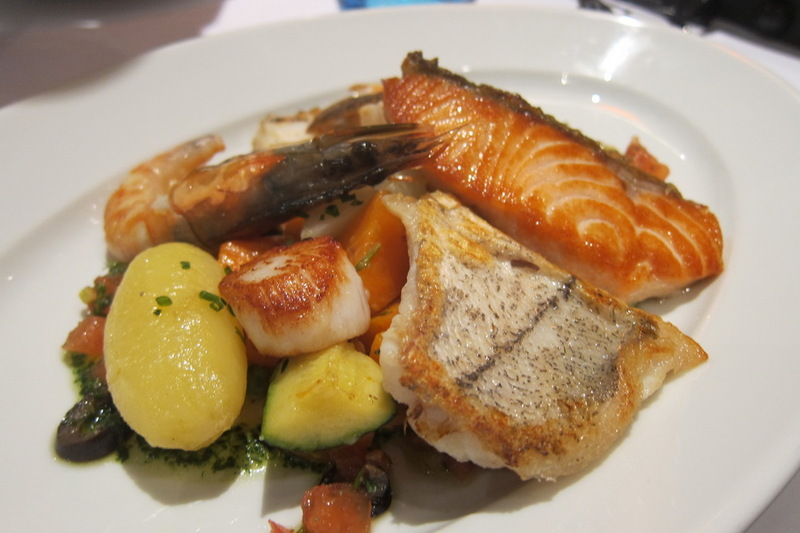 I definitely enjoyed the food and can see why it is the gastronomic capital of France. Wow, this all looks and sounds so delis! 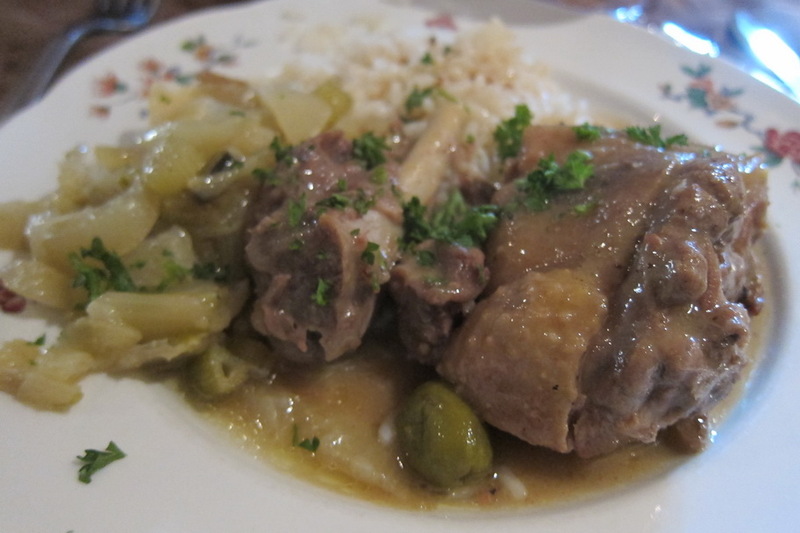 Hope you are enjoying tagines! Is that what those clay pot meals are called?